"Self-expression is the thing! Direct self-expression! But not expressing one's taste, one's education or one's intellect, one's knowledge or one's skills. None of these acquired qualities. Rather the innate, instinctive qualities. And the quest for form - the conscious quest - is bound to involve some kind of mathematics, or geometry, the golden section and so on..." - Extract from a letter from Schönberg to Kandinsky, 24.1.1911. Arnold Schönberg's (1874-1951) creativity was not limited to music. He practised several extra-musical pursuits, producing at least 250 paintings, toys, games, chess sets and playing cards for his own use. He even did his own bookbinding. In around 1909 he created three sets of playing cards. One set used grotesque imagery and visual puns from his caricatures and doodles, with the suit symbols integrated into the designs (see image→). Another set (shown below) is more severe and geometric, almost digital. His inventiveness was driven by a passion for rules, order and numbers, and his cards also reveal his capacity for highly personal expression. 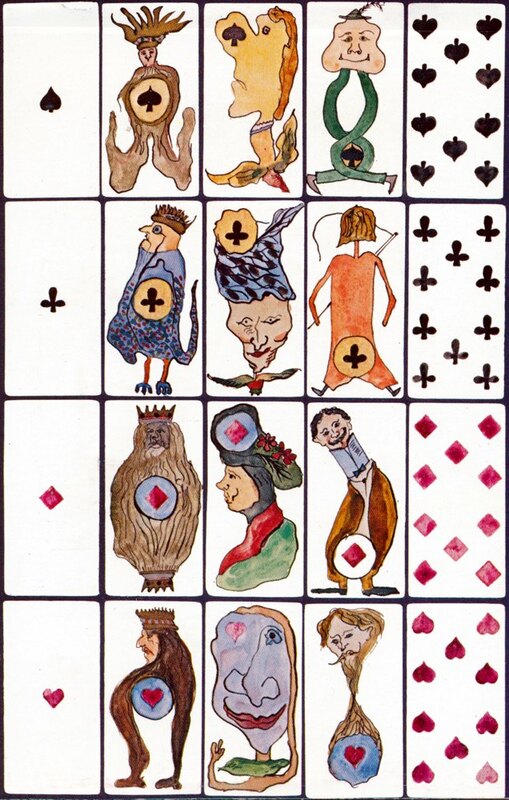 The elongated cards are divided into four suits (based upon clubs, hearts, spades and diamonds) each comprising both numeral and double-ended court cards. The designs don't contain many curves and are more technical than fluid. The influence of Jugendstil is recognisable. The third set is probably for children. 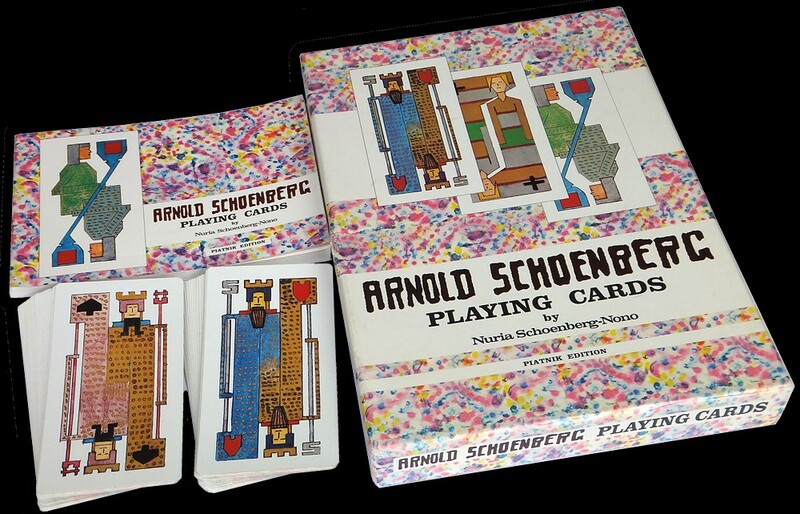 Above: this facsimile edition of playing cards painted by the composer Arnold Schönberg in c.1910 was published by Belmont Music Publishers in 1981 and produced by Ferd Piatnik (Vienna), with a preface by the composer's daughter, Nuria Schoenberg-Nono. 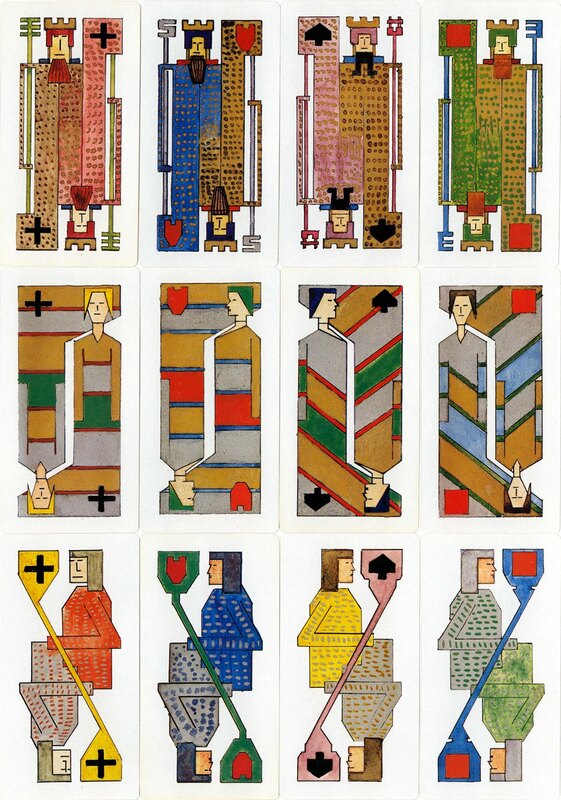 The original cards were made in watercolours and gouache on cardboard with gold and silver, size: 10.5 by 5.5 cm. No reverse has been found for the cards so a coloured pattern painted in one of his diaries was used. (Click above image to see more). Thanks to Eike Fess for additional information; see Arnold Schönberg Centre website. All images courtesy Barney Townshend.